Newport Interactive Marketers took a broader approach to its usual new-media focus to welcome Harvard Business School’s approach to developing a strategy for your brand. NEW STRATEGY GROUP Founder P. Lawrence Fagan earned an MBA from Harvard Business School, where he spent 11 years researching corporate and organization strategy, six years as a member of the HBS research faculty. While at HBS, Mr. Fagan contributed to the development of a general theory of organizations and authored numerous business case studies, several of them bestsellers. 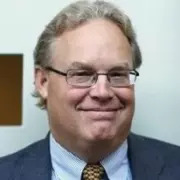 Subsequently, he worked nine years as a strategy leader causing breakthroughs for clients in diverse industries and geographies with Monitor Company, HBS Executive Education, the Corporate Learning division of Harvard Business Publishing, and independently. Strategy is an integrated set of choices an enterprise makes to create a unique and valuable position in market space. Unfortunately, employees seldom know or understand the corporate strategy. A study in Australia found that 70% of the company doesn’t “get it” when their CEO talks about strategy. According to Fagan, we are living in strategy’s dark age. We are so busy with daily tasks that we don’t see the big picture and to develop something that is effective. You must see the big picture. Strategy: The choices we make to build unique and valuable positioning in our markets, enabling us to win. You’ve identified a set of problems on customers’ behalf and owning those problems for them – that’s the key! You must always be different. Different in ways that matter to your target customers. Deliver reliably on your offering. Don’t say one thing and deliver another. Be reliably different. What Is Your Winning Proposition? What is uniquely yours to say? Paint a portrait to the customer to articulate your value proposition. For example, what is the unique winning proposition of Coke Zero? First, determine Coke Zero’s unique qualities and the target audience. Now, craft your unique winning proposition Only Coke Zero gives you zero calories with the same great taste. Don’t miss monthly #NIMRI gatherings. https://newportinteractivemarketing.com/wp-content/uploads/2013/10/PerryFagan.jpg 236 169 nimadmin /wp-content/uploads/2018/04/logo.png nimadmin2013-11-11 06:20:582018-09-25 16:52:48What Is Corporate Strategy?